ASTM G28 is a series a test methods designed to detect susceptibility to intergranular corrosion in wrought, nickel-rich, chromium bearing alloys, including but not limited to alloys such as N06625 and N08800. It can also be effective in evaluating the impacts of heat treatment processes on a materials corrosion resistance. ASTM G48 is a series of test methods designed to determine the resistance of stainless steels and similar alloys to both pitting and crevice corrosion when exposed to an oxidizing, chloride rich environment. This series of tests determines the relative corrosion resistance of stainless steels and nickel based, chromium bearing alloys. It can also be used to determine a minimum temperature required to initiate pitting and crevice corrosion. ASTM G48 can determine the effect that various heat treatments, surface finishes, and alloying additives have on corrosion resistance. 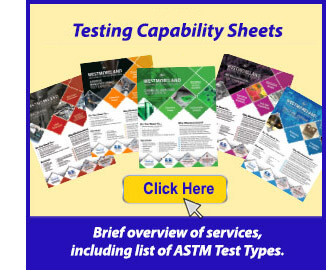 ASTM A262 is a set of practices designed to detect susceptibility to intergranular attack of austenitic stainless steels. The various practices included in ASTM A262 cover a range of reduction potentials, allowing this test to be applied to a wide variety of stainless steels. It can be used to compare different alloys via the corrosion rate determined during testing, as well as ensuring that the corrosion rate of a given piece of material meets the requirements of its end use environment. ASTM G67 is a test designed to determine susceptibility to intergranular corrosion of 5XXX series aluminum alloys. The test is designed to detect precipitation of intermetallic compounds via preferential attack. The intermetallic compound attacked by the ASTM G67 test solution is also susceptible to corrosion in a chloride-containing environment, such as sea water. Severe intergranular attack during the ASTM G67 test can indicate an alloy that will not perform well in a chloride containing environment. WMT&R can perform immersion corrosion to the conditions unique to your requirements under the guidelines of ASTM G31. 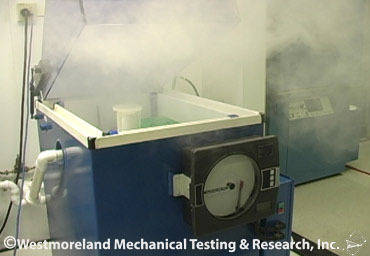 Customization of the test environment can include, but is not limited to, everything from the test temperature, the exact solution your material will encounter during service, the pH of the specimens environment, effects of galvanic corrosion, and having a stress applied to the specimen during testing. ASTM G66 - ASTM G66 is designed to determine susceptibility to exfoliation corrosion of 5XXX series aluminum alloys. ASTM G34 – ASTM G34 is designed to determine susceptibility to exfoliation corrosion of 2XXX and 7XXX series aluminum alloys. ASTM G85 – The salt spray tests of ASTM G85 can be used to determine exfoliation corrosion susceptibility. Annex A2, sometimes called MASMAASIS testing, can be used to test 2XXX, 7XXX, and some 6XXX series aluminum alloys. Annex A3, referred to as SWAAT testing, has proven to be effective in testing 2XXX, 5XXX, and 7XXX series alloys. Annex A4 can also provide a more severe exfoliation corrosion test to be used on more resistant 2XXX and 7XXX series aluminum alloys. ASTM B117 – ASTM B117 utilizes a 5% concentration salt spray at a neutral pH. Test specimens are placed in an enclosed chamber and exposed to the salt spray continuously for a desired duration, ranging anywhere from two hours to well over half of a year. While specimens are typically placed between 15 and 30 degrees from vertical in the chamber, production parts can also be tested in the orientation they will see use in. Some of the many uses for this test include verifying passivation of stainless steels, testing coatings, stress corrosion testing, and determining mass loss rates of different materials for comparison purposes. ASTM G85 – ASTM G85 is a series of 5 modifications to ASTM B117 salt spray testing. They can be applied to ferrous and nonferrous metals, as well as, organic and inorganic coatings. These variations are useful when either a more corrosive or different salt fog environment from that used in B117 is required. ASTM G85 - Annex 1 – ASTM G85 Annex 1 modifies the pH of the salt spray to a range of 3.1 to 3.3 via the addition of acetic acid. This modification of the salt spray test sees use in investigating changes in electroplating processes and various other coating evaluations. ASTM G85 – Annex 2 – ASTM G85 Annex 2 lowers the pH of the salt spray test as in Annex 1, however it also introduces cyclic testing and in increased chamber temperature. The cabinet follows a 6 hour cycle of salt spray, dry-air purging of the chamber, and a high humidity soak. The test can either be run with a wet bottom, where some solution is allowed to remain in the bottom of the chamber during the soak portion, or a dry bottom. Wet bottom ASTM G85 Annex 2 testing is commonly referred to as MASMAASIS testing and sees frequent use in investigating the exfoliation corrosion susceptibility of aluminum alloys. The dry bottom variation is frequently used to evaluate less corrosion resistant coatings, such as some paints coatings which require a less aggressive environment. ASTM G85 Annex 3 – ASTM G85 Annex 3 utilizes a synthetic sea salt solution in place of the standard salt solution, with a pH lowered to between 2.8 and 3.0 with the addition of acetic acid. It can provide a test that is more directly applicable to coatings that will see use in seacoast or marine environments. It can also be used with an increased chamber temperature to investigate exfoliation corrosion of aluminum alloys. ASTM G85 Annex 4 – ASTM G85 Annex 4 modifies the B117 salt spray test via the addition of SO2 to the chamber. The introduction of SO2 gas allows the test to more closely represent the conditions found in industrials areas. The test is typically run in a cyclic manner, with SO2 being introduced to the chamber at set intervals. The salt spray solution can also be run in a cyclic fashion as in Annex 2. ASTM G85 Annex 5 – ASTM G85 Annex 5 uses a solution with a lower concentration of salt, but with the addition of ammonium sulfate. The chamber cycles between 1 hour of salt spray and 1 hour of dry off time, with the drying of the specimens subjecting them to variations of a very dilute solution to a highly concentrated solution. ASTM B368 – ASTM B368 is commonly referred to as the CASS Test, or Copper-Accelerate Acetic Acid-Salt Spray test. The salt solution used in ASTM B117 is modified with the addition of copper chloride. 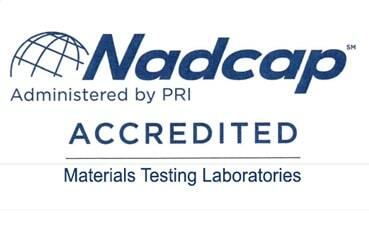 The CASS test was initially developed for use with electrodeposited nickel/chromium and copper/nickel/chromium coatings, and its use has resulted in greatly improved electroplating processes. WMT&R has chambers than can run high humidity testing over a range of desired relative humidity levels and temperatures. High humidity testing can be used for verifying and comparing different passivation processes applied to corrosion resistant materials and the rate at which less corrosion resistant materials deteriorate. It is also frequently used to investigate the effectiveness of coatings. ASTM D2803 – ASTM D2803 is designed to test for the resistance to filiform corrosion of organic coatings on a metal substrate. In high humidity environments, a damaged organic coating can exhibit filiform corrosion, a type of crevice corrosion that occurs underneath thin coatings and can quickly undermine a large portion of the coating. ASTM D2803 determines whether or not filiform corrosion will occur with a given organic coating and substrate. ASTM D2247 – ASTM D2247 is designed to test the water resistance of coatings by placing them in a condensing humidity atmosphere. The conditions of the test result in condensation forming on all surfaces of the test specimen, with water permeating the coating and corroding the substrate at a rate dependent on the coating’s characteristics. Alternate immersion testing is a test designed to alternatingly immerse and then dry the specimen for a given duration. It is most frequently used in investigating the susceptibility of alloys to stress corrosion cracking. When many alloys are in the presence of specific environments which make them susceptible to stress corrosion, cracking can occur at loads significantly below those which would cause a typical mechanical failure. Many high strength aluminum alloys crack in the presence of chloride ions, alkali solutions can lead to unexpected cracking of steels, and copper alloys can crack when exposed to ammonia vapor. The stress component of stress corrosion cracking can be provided not just by an external load, but by internal stresses from the manufacturing process as well. Controlling the risk of stress corrosion cracking is an extremely important process in the design and construction in any industry that uses metal alloy as structural parts. ASTM G44 – ASTM G44 testing provides a framework for an alternate immersion stress corrosion test for metal alloys in a 3.5% sodium chloride solution. It is used primarily for aluminum and ferrous alloys, but can see use with any metal that show susceptibility to chloride ions. ASTM G44 style testing can also be performed in other solutions, such as synthetic sweat and synthetic seawater. 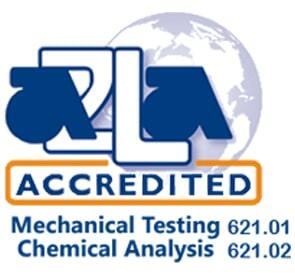 ASTM G47 – ASTM G47 is an alternate immersion test for stress corrosion cracking susceptibility based on ASTM G44, but with duration and specimen types designed to be specific for 2XXX and 7XXX series aluminum alloys. 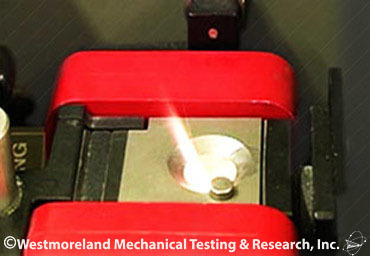 Typical test durations run from 10 to 30 days, however test lengths approaching a year in duration are possible to compare small changes during alloy development. WMT&R is capable of making a testing a wide variety of specimen styles designed to be used for stress corrosion cracking testing. Some of the commonly used specimen types include U-Bend specimens per ASTM G30, C-Ring type specimens per ASTM G38, Bent Beam specimens per ASTM G39, and Direct Tension specimens per ASTM G49. Stressing can be performed via either constant strain or constant load methods. Constant strain testing places a predetermined strain on the specimen, which is held constant throughout the duration of the test. Constant load testing instead, places a predetermined load on the specimen. As pitting occurs on the specimen throughout the test and the cross section is reduced, the strain will increase proportionally due to the constant load placed on the specimen. Specimens for stress corrosion testing can be extracted and tested from materials of any dimension. What Materials Should be Tested for Corrosion? All metals and their alloys are susceptible to some form of corrosion. Mild steels will form red iron oxide when exposed to water and can crack unexpectedly when exposed to alkali solutions. More corrosion resistant stainless steels will be attacked along grain boundaries in acidic environments, with the elevated temperatures of the service environment many steels are exposed to exacerbating the problem, and corrosion resistant alloys can even show stress corrosion cracking in some environments. Copper alloys will crack under low stress when exposed to ammonia vapor. Salt solutions can cause several types of corrosion in aluminum alloys, and even titanium alloys will corrode or crack under conditions commonly found in industrial uses. Coatings including, but not limited to: anodized coatings, electroplate coatings, paints, epoxies, and any type of organic or inorganic coating that can applied can be susceptible to various types of corrosion. Proper application of the coating, including substrate preparation, is imperative for a functional coating, and corrosion testing allows for an accelerated method to determine the effectiveness of your process. Water can penetrate coatings in high humidity environments, leading to blistering underneath as the substrate corrodes. Coatings can also be damaged, leading to corrosion creep from the damaged area underneath the coating, filiform corrosion, or the coating detaching from the substrate entirely. Polymers are susceptible to environmental stress cracking where attacking agents do not necessarily degrade the materials chemically. Environmental stress cracking also occurs in polymers when products are exposed to aggressive chemicals such as acids and alkalis. 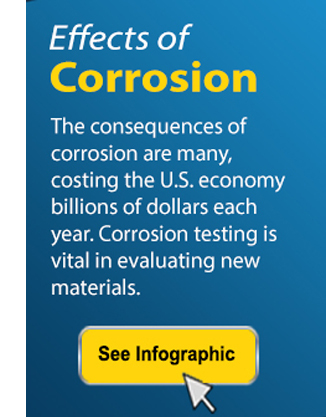 Similar to metals, specific polymers and particular chemicals are more susceptible to corrosion. Polycarbonate is sensitive by alkalis but not to acids. Polyesters are degraded by acids and stress corrosion cracking is a likely failure mechanism. Nylon is sensitive to degradation by acids, a process known as hydrolysis; and nylon molding will crack when exposed to strong acids. For example, a nylon fuel pipe connector can become broken from stress corrosion cracking. The fracture surface of the connector will form a progressive crack from acid to the final cusp of polymer. This failure is caused by hydrolysis of the polymer by contact with the sulfuric acid leaking from a car battery. The degradation reaction is the reverse of the synthesis reaction of the polymer. 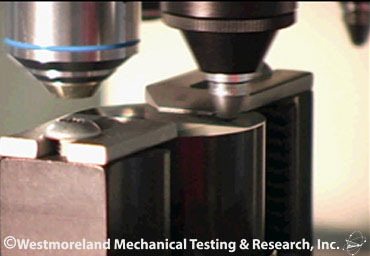 Westmoreland Mechanical Testing & Research, Inc (WMT&R) Corrosion Department has the expertise and capacity to custom design and fabricate innovative fixtures and test setups for the most difficult of customer demands. Custom made stress corrosion frames capable of providing exceptionally high or low loads, and handling unique specimen shapes and sizes, can be manufactured in house to customer requirements. WMT&R has custom-designed, proprietary programmable frames to ensure proper time intervals between NaCl submersion and air environment exposure to ensure accurate simulation of corrosion based on your specific industry testing needs. Westmoreland Mechanical Testing & Research, Inc (WMT&R) has the capacity of loading over to 1000 stress corrosion specimens, to make certain that we have the agility and speed to get your job into testing without delay. The Corrosion Department at WMT&R is equipped with multiple state of the art salt fog chambers with fully programmable interfaces to meet not just the standard ASTM specifications, but tests designed specifically to meet your needs. Corrosion testing is testing of various materials used in industrial applications to verify reliability and conformity of quality for the material. Different corrosion tests reveal different weaknesses in material based on environmental factors which can range from temperature, physical and metallurgical situations, salt spray, and more. Corrosion testing is necessary procedures for the aerospace, automotive, and materials industries which mimic environmental conditions that place repetitive stress on products and materials, causing eventual decomposition and damage to its integrity, resulting in stress corrosion cracking. Stress corrosion cracking, as the name suggests, is a cracking process that requires the simultaneous action of a corroding and sustained tensile stress. Corrosion testing provides accurate estimation of component service life, comparison of materials in service environments, and screens materials and their conditions for specification. Why do I need stress corrosion testing? Controlling stress corrosion cracking is an important process for materials in the design and construction stages. By choosing a material that is not susceptible to stress corrosion in the service environment, and by processing and fabricating it correctly, stress corrosion problems can be reduced or avoided. Stress Corrosion Testing is useful for the Aerospace, Automotive, and Materials industries to assist in material selection, processing, and treatment options related to everyday corrosion stressors such as sweat, rain, humidity, or salt. Corrosion is primarily an inevitable occurrence, but can be controlled or prolonged through various methods such as: application of protective coatings, addition to chemical species to the environment, alternation of an alloy’s chemistry, and surface treatments to metal surfaces. Protective coatings can act as a barrier, which provide superficial protection. These coatings are used to isolate the metal from the environment and their barrier properties are of specific interest. Alloy chemistry can be altered to become more resistant to corrosion. Some species, when added to an electrolyte, migrate to anodic or cathodic sites slowing the corrosion process. Chromates, phosphates, nitrates, moly dates, and various organic compounds provide corrosion protection to piping systems in power plants, chemical processing plants, and the oil and gas industry. Why Are Materials Susceptible to Corrosion? Corrosion is fundamentally caused by the lowering of a system’s Gibbs energy. The production of almost all metals, or engineered components containing metals, involves adding energy to the system. Meanwhile, the metal has a strong driving force to return to its low energy oxide state. This return to the native oxide state is also called corrosion. Even though corrosion is inevitable, corrosion control methods can be used to slow its progress toward the equilibrium rate. Thus, corrosion testing measures the rate of progress to a low energy state in different types of materials. The surfaces of some metals (like aluminum, stainless steel, and titanium) are protected from uniform corrosion by an extremely thin oxide film that forms naturally. Many practical applications of materials depend on the presence of this protective oxide. For example, we would not be able to use materials or structures made from aluminum if it were not for this thin protective film. This film can breakdown locally, resulting in forms of corrosion like pitting of aluminum plates, crevice corrosion of stainless steel fasteners, or steel corrosion cracking of pipes in nuclear reactors. Protection of structures and equipment from these forms of corrosion is both necessary and possible.